United Nations Operation in Somalia II (UNOSOM II) was the second phase of the United Nations intervention in Somalia, from March 1993 until March 1995, after the country had become involved in civil war in 1991. UNOSOM II carried on from the United States-controlled (UN-sanctioned) Unified Task Force (UNITAF). It had been active for a transition period when United Nations Operation in Somalia I (UNOSOM I) mission proved to be ineffectual. All three of these interventions were intended to establish a secure enough environment for humanitarian operations to be carried out, because there was effectively no central government and the country was increasingly subject to factional violence and was suffering from famine, in part due to the warfare and social disruption. The UNOSOM II intervention was associated with the Battle of Mogadishu and related events in which eighteen American soldiers were killed. These events were the basis for the book Black Hawk Down: A Story of Modern War (1999), and its adaptation as a film of the same name. Following the failure of the monitoring mission created as UNOSOM by the United Nations, the United States offered to lead a substantial intervention force, made up chiefly of American personnel. This was accepted by the UN and made possible through United Nations Security Council Resolution 794, authorizing the use of "all necessary means to establish as soon as possible a secure environment for humanitarian relief operations in Somalia". The Security Council urged the Secretary-General and member states to make arrangements for "the unified command and control" of the military forces that would be involved. On the evening of 4 December 1992, U.S. President George H. W. Bush addressed the nation, informing them that U.S. troops would be sent to Somalia. The U.S. contribution would be known as Operation Restore Hope, which joined a multinational force and became known as the United Task Force (UNITAF). The operations of UNOSOM I were suspended. UNITAF was authorized under Chapter VII of the United Nations Charter. The United States intended UNITAF and U.S control as a transitional action. The mission consisted of four phases. The first phase was the initial deployment of troops to provide secure harbor and airport sites in Mogadishu, from where the entire operation would be managed. Second was the expansion of the security zone to the surrounding regions of southern Somalia. Due to a more lenient environment than expected and the encouragement from NGOs (Non-governmental Organizations), UNITAF forces accomplished phase two a couple of weeks ahead of schedule. Third, the forces would expand the security zone into Kismayo and Bardera and maintain secure land routes for humanitarian operations throughout the security zone. The fourth and final phase consisted of the US handing over operations to the United Nations and withdrawing most of the UNITAF forces. On 3 March 1993, the Secretary-General submitted to the Security Council his recommendations for effecting the transition from UNITAF to UNOSOM II. He noted that despite the size of the UNITAF mission, a secure environment was not yet established. There was still no effective functioning government or local security/police force. The Secretary-General concluded that, should the Security Council determine that the time had come for the transition from UNITAF to UNOSOM II, the latter should be endowed with enforcement powers under Chapter VII of the United Nations Charter to establish a secure environment throughout Somalia. UNOSOM II would therefore seek to complete the task begun by UNITAF. The new mandate would also empower UNOSOM II to assist in rebuilding their economic, political and social life, so as to recreate a Somali State. The new UN-controlled mission, to be called UNOSOM II, was established by the Security Council in Resolution 814 (1993) on 26 March 1993. It did not formally take over operations in Somalia until UNITAF was dissolved on 4 May 1993. 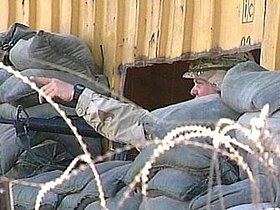 An American soldier at the main entrance to the Port of Mogadishu points to identify a sniper's possible firing position (January 1994). 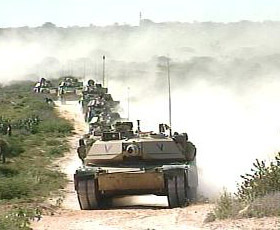 An armoured column of M1A1 Abrams Tanks and M2 Bradley IFVs move down a dirt road outside the city of Mogadishu, Somalia. (January 1994). A Saudi Arabian High-Mobility Multipurpose Wheeled Vehicles (HMMWV) wait for food stores to be off-loaded at the Mogadishu seaport. The food will be provided to the Somali people. A federalist government based on 18 autonomous regions was agreed upon by the leaders of Somalia's various armed factions. It was the objective of UNOSOM II to support this new system and initiate nation-building in Somalia. This included disarming the various factions, restoring law and order,[clarification needed] helping the people to set up a representative government, and restoring infrastructure. UNOSOM II had a strength of 28,000 personnel, including 22,000 troops and 8,000 logistic and civilian staff from Algeria, Australia, Austria, Bangladesh, Belgium, Botswana, Canada, Denmark, Egypt, Fiji, Finland, France, Germany, Greece, India, Indonesia, Ireland, Italy, Kuwait, Jordan, Malaysia, Morocco, Nepal, New Zealand, Nigeria, Norway, Pakistan, Philippines, Spain, South Korea, Romania, Saudi Arabia, Sweden, Switzerland, Tunisia, Turkey, the United Arab Emirates, the United Kingdom, the United States and Zimbabwe. The US also provided 1,167 troops for a Quick Reaction Force under US operational control that would be stationed on US Navy ships off the coast of Somalia (see Carrier Strike Group 6). This force would respond to emergency threats to UNOSOM II but only if US Central Command in Florida approved. On 5 June, a Pakistani force was sent to investigate an arms depot belonging to a Somali warlord vying for the Presidency, Mohamed Farrah Aidid. When the Pakistani force arrived, they encountered angry Somali protesters. Twenty-four Pakistani soldiers inspecting weapons as part of the expanded UN mandate were killed when "forces believed to be associated with Aidid allegedly launched a fatal attack on peacekeeping forces." The UN responded the next day with Resolution 837, reaffirming that the secretary-general was authorized to "take all necessary measures against those responsible for the armed attacks and to establish the effective authority of UNOSOM II throughout Somalia." This was essentially equivalent to declaring war on Aidid and his army, a declaration that would lead to numerous confrontations between UNOSOM II personnel and Aidid's militia. UNOSOM II had much fewer war-fighting resources than UNITAF, but it was much more ambitious and aggressive. On 12 June 1993 U.S. troops started attacking targets in Mogadishu in hopes of finding Aidid, a campaign which lasted until 16 June. On 17 June, a $25,000 warrant was issued by Admiral Jonathan Howe for information leading to the arrest of Aidid, but he was never captured. Howe also requested a counter-terrorist rescue force after the killings of the Pakistani troops. The hunt for Aidid characterised much of the UNOSOM II intervention. The increasing tempo of military operations carried out in Mogadishu began to cause civilian casualties and affected the relationship between the foreign troops and the Somali people. The UN troops were portrayed as foreign interlopers, particularly after incidents of civilian casualties caused by wholesale firing into crowds. On July 12, a house where clan leaders were meeting was attacked by US AH-1 Cobra helicopters. Several buildings were destroyed and many Somalis died. When four western journalists went to investigate the scene, they were beaten to death by a Somali mob. The journalists were Hansi Krauss of Associated Press and Dan Eldon, Hos Maina and Anthony Macharia, all of Reuters. Somalis that had been disappointed by the failure of the UN to disarm the warlords in Mogadishu actually began to support those same warlords with a "us versus them" rationale. Islamism also began to rise, as militia leaders sought to use religion as a rallying point for anti-UN sentiment. As the Americans became more insular, the warlords began to reassert control of many Mogadishu districts. With each failure to apprehend Aidid, the militias grew more bold. Serious rifts between nations contributing to UNOSOM II also began to develop, with Italy in particular being a major critic of the American methods. Somali militias began targeting peacekeepers, causing further casualties. On 8 August, Aidid's militia detonated a remote controlled bomb against an American military vehicle, first killed four American soldiers and then, two weeks later, injured seven more. In response, President Bill Clinton approved the proposal to deploy a special task force composed of 400 US Army Rangers and Delta-force Commandos. This unit, named Task Force Ranger, consisted of 160 elite US troops. They flew to Mogadishu and began a manhunt for Aidid in what became known as Operation Gothic Serpent. On October 3, 1993, Task Force Ranger raided a hotel in Mogadishu in which Aidid was thought to be hiding. What ensued was the longest, bloodiest and deadliest battle for US troops in Somalia. In what later became known as the Battle of Mogadishu, eighteen US soldiers were killed. Images of their dead bodies being dragged through the streets were broadcast on television stations all over the world, horrifying and infuriating the American public. On October 7 in a nationwide television address, President Clinton "effectively ended the US proactive policy in Somalia" and "called for the withdrawal of all US forces no later than March 31, 1994." Resolution 954, passed on November 4, extended the UNOSOM mandate for a final period until March 31, 1995. American soldiers completely withdrew on March 3, 1994, 28 days earlier than expected. Other western nations, such as Italy, Belgium, France and Sweden, also decided to withdraw at this time. On November 4, 1994, after "peacemaking" efforts by the 1,900 UNOSOM II troops failed, the United Nations Security Council (UNSC) voted unanimously to withdraw all forces in Resolution 954. On November 16, the UNSC authorized Resolution 897, placing new emphasis on peacemaking and reconstruction and returning to a less reactive role. UNOSOM II's mandate ended in March 1995 when US ships off the coast of Somalia assisted in the safe departure of the remaining UNOSOM troops. In early 1994 the Security Council set a deadline for the mission of March 1995. The withdrawal of UN troops from Somalia was completed on March 28, 1995. Various reconciliation talks were carried out over the next few months providing for a ceasefire, the disarmament of militias and a conference to appoint a new Government. However, preparations for the conference were repeatedly postponed and many faction leaders simply ignored the agreements at will. Aidid's son Hussein Mohamed Farrah took over after his father's death in a battle in August 1996. He was a former US Marine who served during Operation Restore Hope in 1992. Somalia participated in talks in December 1997 held in Cairo, Egypt, where Aidid and Mahdi, another Somali warlord, signed a "Declaration of Principles". The declaration promised to launch reconciliation conferences in February, 1998 and to prepare a transitional government charter. Walter Clarke, who was Deputy Chief of Mission for the U.S. Embassy in Somalia during Operation Restore Hope, and Jeffrey Herbst, Associate Professor, Woodrow Wilson School, Princeton University, conclude that "The intervention in Somalia was not an abject failure; an estimated 100,000 lives were saved. But its mismanagement should be an object lesson for peacekeepers ... on other such missions." ^ "Peacekeeping Contributor Profile: Australia". Retrieved 14 December 2017. ^ "Peacekeeping Contributor Profile: Austria". Retrieved 14 December 2017. ^ "Peacekeeping Contributor Profile: Bangladesh". Retrieved 14 December 2017. ^ "Peacekeeping Contributor Profile: Belgium". Retrieved 14 December 2017. ^ "Peacekeeping Contributor Profile: France". Retrieved 14 December 2017. ^ "Peacekeeping Contributor Profile: Germany". Retrieved 13 December 2017. ^ "India - Somalia Relations" (PDF). Ministry of External Affairs. February 2016. Retrieved 3 April 2017. ^ Thomas G. Weiss and Don Hubert, The Responsibility to Protect: Research, Bibliography, Background: Supplementary Volume to the Report of the International Commission on Intervention and State Sovereignty, Vol. 2. (Canada: International Development Research Centre, 2001). ^ United Nations, Security Council resolution 794 (1992), 24/4/92, para. 3. ^ a b UNITED NATIONS OPERATION IN SOMALIA I, UN Dept of Peacekeeping. ^ Dorcas McCoy, "American Post-Cold War Images and Foreign Policy Preferences Toward 'Dependent' States: A Case Study of Somalia," World Affairs 163, no. 1 (Summer 2000): 43. ^ James Mayall, The New Interventionism 1991-1994: United Nations Experience in Cambodia, Former Yugoslavia and Somalia (Cambridge: Cambridge University Press, 1996), 110. ^ Reuters News Agency, 1993, "Somalian targets hit by new air strikes Warlord accuses UN of genocide, refuses to negotiate until attacks end", published 15/6/93 in The Globe and Mail. ^ Lorch, Donatella, "20 Somalis Die When Peacekeepers Fire at Crowd", The New York Times, 14/6/93. ^ Cowell, Alan, 1993, "Italy, In U.N. Rift, Threatens Recall Of Somalia Troops", The New York Times, 16/7/93. ^ Bowden, Mark (1999). Black Hawk Down: A Story of Modern War. New York: Signet. p. 114. ^ United Nations Operations in Somalia II, Background (Summary) Archived October 1, 2006, at the Wayback Machine. ^ Somalia and the Future of Humanitarian Intervention By Walter Clarke and Jeffrey Herbst. Allard, Colonel Kenneth, Somalia Operations: Lessons Learned, National Defense University Press (1995).